Valentine's Day is just around the corner, and do you know what that means? It means that I got into a "I want to do extravagant makeup and just play about" mood. So I hopped on to Pinterest to get a bit of inspiration and I thought I'd show you all what I came up with. Obviously, these looks were not designed for every day wear and are just a bit of fun, however, if you wanted to wear one of them on a date or a Galentine's date, that would be amazing! I think that I might turn the whole '3 looks, 1 palette' into a thing because I'm certain it would help me to love the makeup that I own. As I wrote in my 2019 goals, I'd love to do more beauty content this year and use up the makeup that I have. I've got a bit of a problem when it comes to eyeshadows and I find it very difficult to stop buying them, but by making a bit of a series where I play about with the eyeshadows I own, I might end up getting a bit of use out of them! Let me know what you think. With that in mind, for this post, I only used the Blood Sugar palette from Jeffree Star. This was a palette that I treated myself to after Christmas and I've been a bit iffy about using it because it cost so much money. However, I didn't buy it just to look at (even though it is beautiful) - I bought it so I could use it, so it was time to get over that fear and really put some of the shadows to the test. 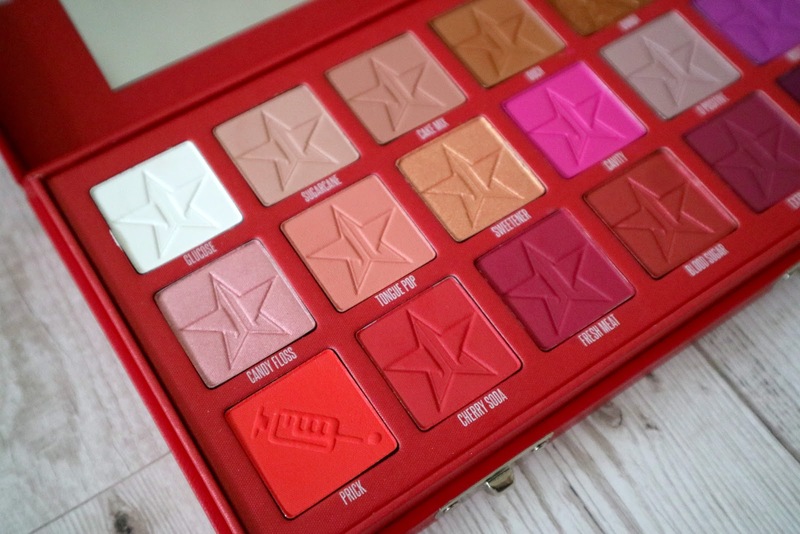 If you're interested, I did a full first impressions on the palette, complete with swatches and a whole load of opinions. But it's the perfect palette for Valentine's because it's packed full of reds, pinks and soft neutrals for more flirty looks, so let's have a peek at what I created. 'Pink to make the boys wink' was a phrase that my grandma used to say quite a lot, but I'm only just realising now how odd it is! But it fits this look perfectly as I went in on the pinks. I wanted there to be at least one wearable look in the 3 that I created, so I decided to have a go at doing a winged cut crease. You guys know about my cut crease struggles, but I'm pretty chuffed with how this turned out! I primed my lids with Makeup Revolution's Conceal & Define and set them with a light dusting of Sugarcane. With a fluffy brush, I dragged Cavity throughout my crease, blending up towards the brow bone and out towards the tail of my brow (if you read my Blood Sugar first impressions, you'll know that this was a shade I was scared of using, but look at how amazing it is!). Using another fluffy brush, I dipped into Fresh Meat and deepened up my crease, then added a touch of Coma to deepen it further, blending as I went. With the Conceal & Define, I carved out my crease and added a flick towards the tail of my brow. I set this with Sugarcane. With a packing brush, I patted Candy Floss over my lid and into the flick. For a little extra sparkle, I used my finger to lightly tap Sweetener on top. On the lower lash line, I used Fresh Meat and Cavity, and dragged them up to meet the flick. I added an extended cat flick with the No7 Stay Perfect liner, a coat of Tarte's Maneater mascara and some of Tarte's Amazonian Clay highlighter in Exposed, and the look was complete! As I said, this look was designed to be a bit more wearable than the others that I came up with and I realise that some of you are looking at the bright pink and think "wearable?!" 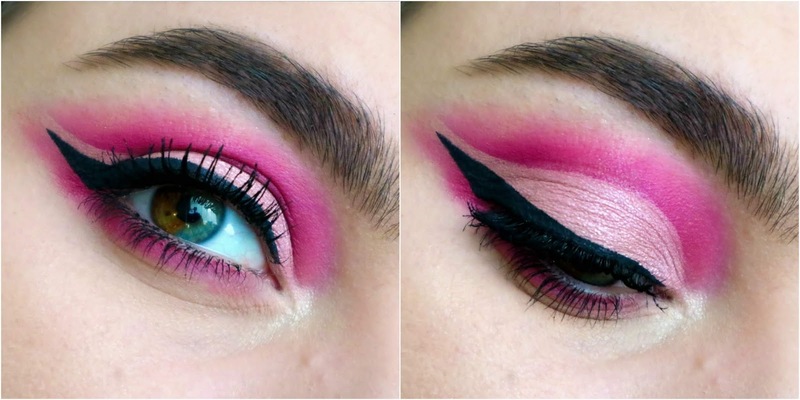 You could easily switch up the colours though to make it something that would be more appealing to you, but I think that the flicked cut crease is a great way to make the look a bit more interesting! Everyone loves the little heart eye emoji and this look was inspired by him. 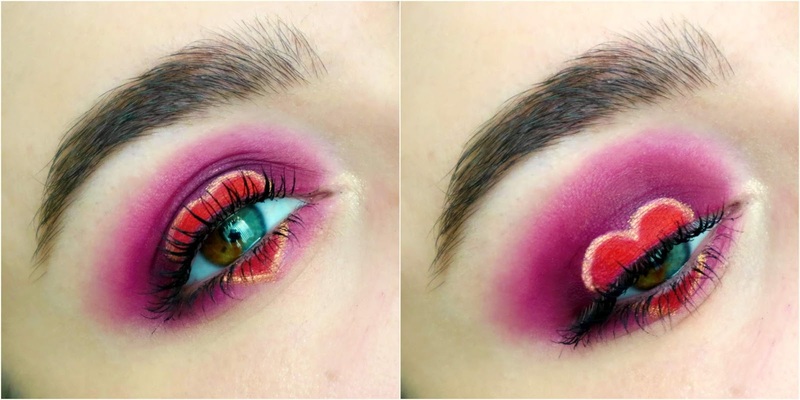 As someone who isn't well versed in the world of cut creases, this took a lot more effort than I'd like to admit, so this is definitely for those people who want to have a bit of oomph this Valentine's. And while it's not perfect, I'm really proud of it! I primed my lids with Makeup Revolution's Conceal & Define and patted Coma, the darkest shade in the palette, over the whole lid. I smoked Coma up into the crease and on the lower lash line, and used a bit of Extraction to fade it out. Using the Conceal & Define and a flat, precision shadow brush, I cut out the shape of the top of a heart on my lid. On the lower lash line, I carved out an inverted triangle shape for the bottom of the heart. I patted the shade Prick on top of the concealer heart and added a little bit of Cherry Soda to deepen the colour. I spritzed a detailer brush with Urban Decay's All Nighter spray and dipped into Donor, then outlined the heart shape. It would also look great outlined with black liner. I put on a coat of Tarte's Maneater mascara and a touch of Tarte's Amazonian Clay highlighter in Exposed to the inner corner, and I was done! If I was to do this look again, I think I'd use a different base shade to Coma. I do think the purple works, but I was looking for an opaque base and it just didn't seem to be working for me. I tried my best though, and like I said, I'm really pleased with how it turned out. I never ever do avant-garde looks like this, but I had so much fun doing it that it's definitely something I'll dabble in when playing about next time. This is by far my favourite look that I created. It's somewhere in between wearable and a little bit more adventurous. It's a style that I love, but colours that I wouldn't normally gravitate too, and those little hearts aren't something that I'd consider adding to an every day look. It was a ton of fun to do, so if you were considering trying out any of these looks, definitely give this a go! With a fluffy brush, I dragged Cavity through my crease and patted it on to the inner and outer corners of my lid, keeping the centre clear. With another fluffy brush, I took Root Canal and added it to the crease to deepen the colour and blended it up towards the brow bone. This didn't look how I had hoped, so I went back in with Cavity and blended it out. I added Extraction into the crease and the outer and inner corners of my lid to add a bit of depth, then finished the crease off with a little bit of Coma. I dragged Extraction out on to the lower lash line and ran Coma as close to my lashes as I could. For the centre of the lid, I wanted a pop of warmth, so using a packing brush, I filled in the middle of my lid with Blood Sugar. Then, using my finger, I lightly tapped Sweetener on top to give it a gold shift. I added a cat flick with the No7 Stay Perfect liner, a coat of Tarte's Maneater mascara and some of Tarte's Amazonian Clay highlighter in Exposed in the inner corner. For the little hearts, I used to Conceal & Define and a detailer brush to carefully draw the heart shapes on to my lid. I then used another detailer brush to gently tap Glucose on top to make them stand out. 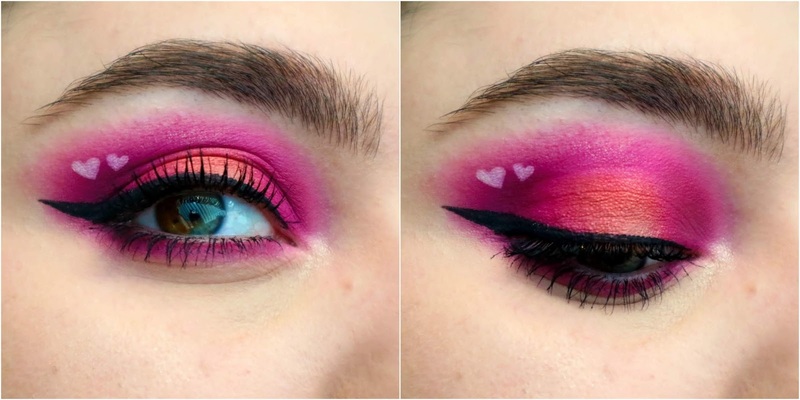 Of course, crazy pink makeup isn't for everyone, so whether you're going out or staying cuddled up inside this Valentine's Day, put whatever makes you feel good on your face. If that's a whole load of makeup, then great! If that's nothing at all, brilliant! I just like an excuse to play with makeup, so I hope you enjoyed taking a look at what I came up with. I know I'm no MUA, but this is something I love doing, so if you'd like to see more posts like this, let me know!